Technology is creeping into every aspect of our lives. Now, it’s starting to impact our fitness, mindfulness, how we interact with others, and the physical design of spaces around us. I’ve been very passionate about fitness for the last few years, and am active in CrossFit, Spartan events and more, as a result, I’ve used many a technologies from hardware devices to software apps to track my performance. We’ve been researching this Modern Wellbeing (modern meaning, technology) for several months, and have helped a few clients on their innovation work in this arena. To best articulate the many changes we see in this market, we put together this visual diagram which illustrates how technology is integrating into our lives. The hi-res infographic is below, I encourage you to widely share it, pass it on to others, and even print it out as you go on a journey integrating technology with your life. If you want to learn more about our research on this topic, you could register on the Kaleido website. Click above video or access directly: Tim Cook describes how he wants users to curb their phone addictions and have “a great life” without being tethered to the phone, features include data on app usage, and ability for users to limit notifications, apps, and overall time on device. By Jeremiah Owyang, Jessica Groopman, Rebecca Lieb, and Jaimy Szymanski. Apple is leading self-regulation of the tech industry by enabling users to impose limits on the time they spend on social networks. The company, which has 44% of smartphone market share in the USA, is using its hardware and software platforms to become the arbiter of balance in our lives, by providing multiple features that will: gauge how much technology we’re using, and provide us with tools to limit and manage our social media usage. We don’t expect wild-scale consumer adoption of this feature, but we do believe this is the first in a series of self-regulation features that will be introduced by the industry. In the long term, this trend will serious implications for marketers in the coming years and pose an existential crises to Facebook. Apple has announced a variety of tools to limit “anxiety-tech,” including dashboards of time spent on seemingly pointless apps, limiting interruptive notifications, and reports on usage. Parents will have stronger controls to manage how children (and adults) use technology. The big question is, will the normal user opt-in to use these tech-limiting features? While we think most users will be skeptical, those who are more mindful are more likely to adopt. There’s already a slew of apps that measure and limit screen time that are gaining adoption. Senator Mark Warner, was recently quoted saying, “the era of the wild west in social media is coming to an end,” suggesting that federal lawmakers seek to regulate social networks. Also, former Facebook security chief Alex Stamos wrote shortly after leaving the social networking giant, ”In some ways, the United States has broadcast to the world that it doesn’t take these issues seriously,” showing the concern from even within the social network. Overall tech giants don’t want to be regulated by government bodies –it’s in their best favor to self-regulate, and in this interesting case, Apple is regulating Facebook. Historically, technology goes through patterns of early adopters, widespread adoption, various issues arise, and the industry often is regulated. This has occurred with spam, search, native ads, and now with social network over-adoption –the difference here is that Apple is providing features for users to “self-regulate” their Facebook additions. Silicon Valley must reevaluate purpose and even business models as users and society questions their role in our lives. The biggest question remains, can tech companies self-regulate faster than law makers around the globe? It depends on the makeup of each company. We’re already seeing Google try to appease users, launching a campaign called Google Digital Well Being which suggests that in order to reduce constant interruptions from apps and social networks, that users ought to rely on Google AI, and “Make Google do it”. Not only would this put Google’s AI as the center of users’ life, it would cost you a few thousand dollars to purchase all the hardware they recommend. As some mindful users limit their social networking time, it will make it harder for media creators and marketers to reach them. engagement features such as likes and comments means engaging content will have fewer signals,–reducing the spread of content. If these features gain traction, fewer ads will be viewed, which we believe will result in marketers needing to focus on higher quality content, or deeper engagement apps. Create more compelling content. Marketers can’t be lazy, rehashing photos from one social channel to the next. As time and attention become more limited, they’ll need to up their game. Marketers will try to shift users off social networks by engaging them on SMS, email marketing, or inviting users to download their own branded apps to engage, perhaps with conversational bots. Over time, limiting social network usage means marketers may limit the user of Facebook Connect as a rapid registration method on microsites or campaigns. We will see a decrease in the social marketing advertising budget. We may see marketers focus more on real-world-events in the face of a digital detox trend. Where does this leave us? Apple (and Google) will push its own feature sets to enable users to suppress annoying and harmful apps. This is a display of might but also puts user needs into the center of their value proposition. Users are already more likely to trust Apple, who they pay high amounts of money for their premium product –rather than the advertising based models that have gotten Facebook into so much trouble as they strive to keep our attention. While we anticipate only early adopters will initially enable these features, this will be the first in many moves to curb excess notifications, pop-ups, and addictive behaviors. As this continues, the tech industry will be able to self-regulate ahead of government institutions. For marketers, this spells an even more difficult way to reach customers in social networks, so they’ll shift to in-person events, native apps, or other direct communication tools. Finally, attention economy-based companies like Facebook will need to evaluate business models that are better both for users and the ecosystem. In a world of fleeting tweets and memes, it’s important to ground your business based on in-depth research. Kaleido’s latest 50-page report on AI Readiness, get your company on the right track as they adopt automation. We offer both a sample at no-cost, and ability to purchase the entire 50-page report. I’ve been interviewing many companies on how they’ve been rolling out AI for their customer-facing engagements as well as for customer care use cases. One thing is very clear, they’re experimenting, and in most cases, they don’t have the full support of the rest of the organization. My talented business partner Jessica Groopman, has published an in depth 50-page report which gives unseen insights, pragmatic recommendations based off interviews and research on how companies need to be prepared for AI. Surprisingly, much of the readiness isn’t just about getting technology and data cleansed –there’s many cultural, impacts, including preparing employees and even setting up a clear code of ethics. Strategy: AI-driven transformation begins with ground-up problem-solving, but must be supported by a foundation of governance and aligned with business objectives and enterprise data strategy. While approaches and metrics vary by organizational maturity, customer experience is always true north. People: Preparing people for AI is as important as preparing data, and it is essential for businesses to prioritize human factors over technological capabilities. Instill the “AI Mindset” across myriad stakeholder groups; foster lockstep coordination between technical and product, and address AI’s limitations and cultural stigma head-on. Data: Data preparedness is not a linear destination. 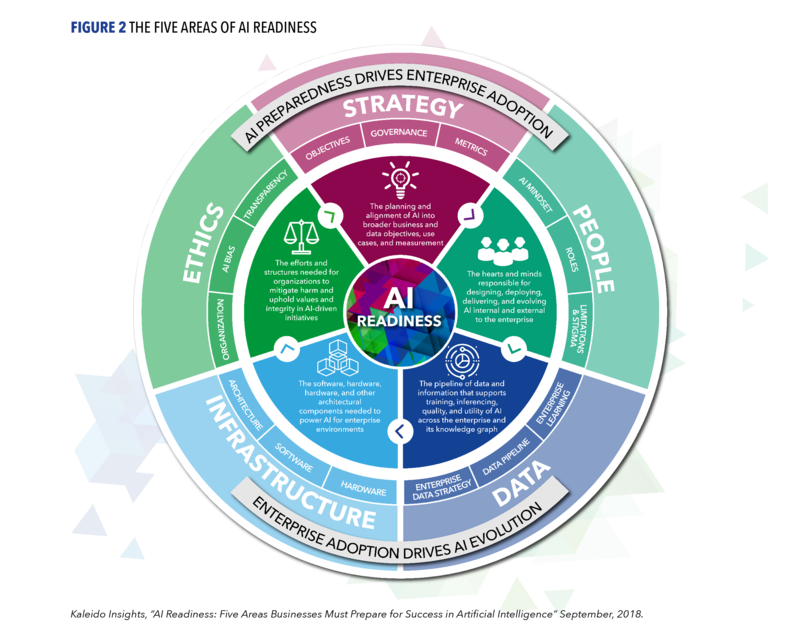 AI data readiness requires organizations address their broader data strategy and orchestrate data pipelines and resources for ongoing enterprise learning and evolution. Infrastructure: Decision-making around the technical architecture and integrations required to deploy AI must align with core product strategy, balance reliability with flexibility, and account for rapidly evolving AI software, hardware, and firmware. Ethics: The mass automation of big data and AI call for a new business competency: a formalized approach to organizational resources, bias assessment, transparency, and ethical preparedness. Get the report, and get your company ready for AI. Is Technology making us Calm — or causing us Anxiety? 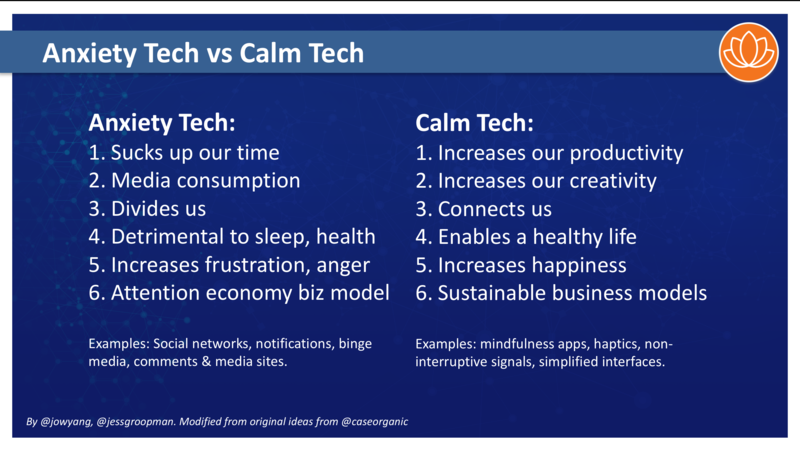 Is the technology in your life making you Calm? Or increasing your Anxiety? When you look around at all the beeping and blinking apps and devices, most of the technology in our lives is trying to get and hold our attention. Even media websites and social networks are trying to get your eyeballs for ad-based monetization, even at the detriment of emotionally hooking us as we fight over politics or coo over kitty videos. To best illustrate the dichotomy, here’s a slide from a research project on “Modern Wellness” I’m working on with colleague Jessica Groopman for a client who’s building out new technology and wants to be on the right side of history. It’s based off key points that Amber Case presented at a keynote she delivered at Anxiety Tech in SF, and she blessed I could share it here. Much of the concern of Anxiety tech is that the tech companies are often operating on an “attention economy” model. Free software or content, in exchange for advertisers who pay to reach you. As a result your data is sold for attention. When people are the product — they are treated like commodities. I surveyed a number of tech folks, and found that they have the highest trust with Apple and Google. They trust Apple as they pay a hefty price to use their hardware and software, and there’s been no history of Apple betraying users data. I’ve heard similar responses to Google, despite much of their business model being attention economy (search ads are 70% of the revenue). In order to rethink this business model, one idea would be to offer premium based social networks and media networks — but savvy thinkers realize this would create an elite internet separate from the less fortunate, further perpetuating societal issues. Some had suggested government provided social networks. Unsure this makes sense, as some government media doesn’t end up being on the side of the people. A mixture of business models that enable companies like Facebook to also generate revenues from other product offerings like devices, ecommerce sales, and beyond. Coop owned technology companies where the users own the equity (see Juno in NY) perhaps blockchain based companies that offer to their users, as a form of reward and loyalty. Love to hear your thoughts of other solutions, this will shape society as we know it. Download high res version here. Though consumer applications may receive most of the fanfare, mixed reality technologies offer enterprises many opportunities to supercharge employee skill-sets as well. Utilizing internal-facing augmented reality (AR) and virtual reality (VR) applications––often referred to simply as “XR” for “extended reality”––companies can increase collaboration and transform traditional approaches to education and training, repairs and maintenance, sales, product and site design, and more. Engineering and Design Modeling: Utilizing 3D modeling in engineering products is a tried-and-true method in most manufacturing environments. Reviewing designs in a collaborative VR space offers novel opportunities as traditional computer-aided design and modeling (CAD/CAM) technologies evolve. Training and Employee Education: Conducting training exercises in a VR environment offers many benefits over real-world programs, including increased safety; managing information transfer amidst high employee turnover; scaling trainers; and upskilling existing workers. Real-time Information Overlay: Primarily a use case meant for AR, real-time information is provided to a viewer utilizing wearable AR headsets or accessible through a mobile device or tablet via an AR app, while simultaneously viewing real-world surroundings. Theft Protection: Though primarily retail in its industrial application, theft protection is an emerging use case utilized by large retailers to combat shrinkage of high ticket-value items. B2B Sales: VR and AR can offer new, immersive opportunities to sell industrial products while simultaneously increasing portability and scaling salesperson efforts. Marketing and Entertainment: AR and VR content marketing is a growing field for digital marketers looking to reach audiences in new, engaging ways in order to compete with other online and mobile experiences. From designing machinery in a collaborative VR space to avoid collision issues, to utilizing AR wearables to overlay information for technician repairs in real-time, the XR space is filled with opportunity for innovative corporations seeking to empower “super employees” while achieving greater efficiencies and engagement. Like many modern-day superheroes, these employees are strengthened with superpowers made possible via technological sidekicks that augment their bionic brains. 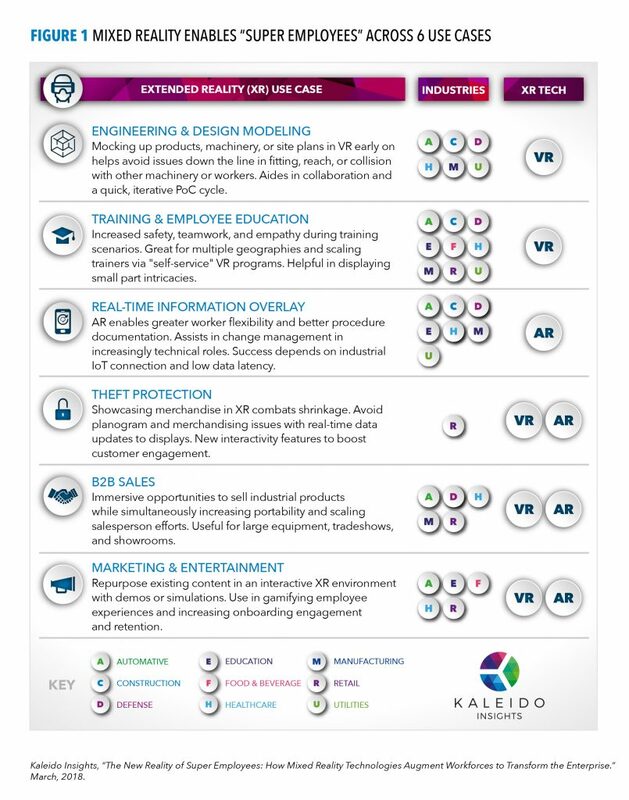 Learn more about each enterprise XR use case, as well as challenges to adoption and recommendations for implementation, by downloading the full report here. By Jeremiah Owyang and Jessica Groopman, Kaleido Insights Analysts. A new category of software companies must emerge, these companies enable a business to manage multiple virtual assistant experiences from one single platform. Business needs: marketing, customer care, and other departments are struggling to manage various virtual assistant and AI platforms ranging from Alexa, Cortana, Facebook messenger, and beyond. The APIs will frequently change, often without notice, multiple scripts will have to be integrated and managed per each platform. We’ll obtain more business requirements from the large companies we speak with on a regular basis. If this patterns sounds familiar, we saw this same exact market movement in the social business industry, and a rise of Social Media Management Systems emerged (I covered this market at great length) to manage dozens of social networks with ever varied and changing platforms.